At age 56, I don’t consider myself a senior. No matter what my future age, I may never consider myself a senior! Age is just a number. Most days I feel much younger and some days, I definitely feel every one of my years, and more. National Senior Health & Fitness Day is celebrated nationwide, usually on the last Wednesday of May. It is an event in which thousands of older adults can take part in fairs and programs designed to promote the importance of regular physical activity and to showcase what local organizations are doing to improve the health and fitness of seniors in their communities. 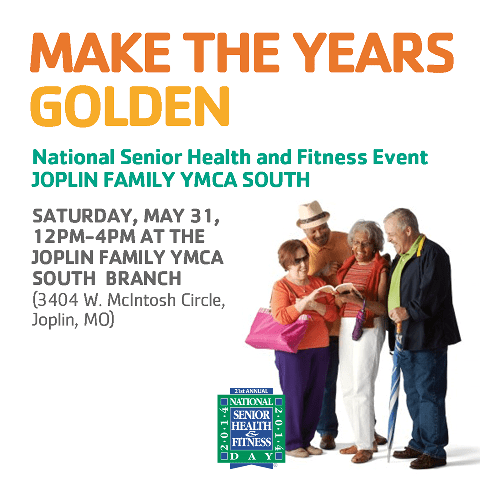 The Joplin Family Y participated this year, for the first time I believe, and held their Senior Health & Fitness Day today, from noon – 4:00, at the South Y location. Non members could sign up for a free one month membership. All participants could win prizes playing bingo, receive other give aways, eat snacks, visit the 20 vendor booths set up and watch and participate in exercise classes, including Zumba Gold. I am a member of that class, participating three times a week under the instruction of Zumba master, Dave. My first for today was to take part in a Zumba demonstration during the National Senior Health & Fitness Day at the Y. This was a great experience. Our first demo took the form of a flash mob. While seniors were milling about and playing bingo, Dave, standing alone among them, started the music for one of our songs. The rest of us came from varying places around the gymnasium, joining him. We did a lively routine and included a hilarious moment where the class, all ladies, shouted out Dave’s name as we shimmied. Moving to a designated area, we did a portion of our regular class, inviting others to participate. Various people joined us for a song or two, or the entire class. Although the gym was very warm and we missed the fans we normally have blasting away in our upstairs exercise room, we gave it our very best effort and enjoyed the extra day of Zumba. Dave, expressive and fun loving, did a great job leading the dances. He was aware of the warmer temps and shortened the class so we wouldn’t overheat. Back out among the older adults in the main part of the gym, we did our last routine, a very funny number we recently learned. It was the perfect way to finish up, with laughter and smiles and applause. We were all sweaty but happy to have participated and to show the benefits of Zumba. It is a great form of exercise and a great way to connect with others. Victoria Moran, author of Younger by the Day: 365 Ways Rejuvenate Your Body & Revitalize Your Spirit says, “Just because you’re grown up and then some doesn’t mean settling into the doldrums of predictability. Surprise people. Surprise yourself.” I love that. I hope today, as we appeared behind Dave, moving to the strong beat of Latin music, that we surprised people and showed them that being healthy can be fun. I know I continue to surprise, and delight, myself during this year of firsts. May I ever continue to do so.